Totally Blue It! A full color changing deck routine (no gimmicks). A red deck and box are shown. A card is memorized by the spectator then placed in the center of the deck. An indifferent card is shown as if you blew it but then instantly changes to their card! You might have thought "I Blew It", actually "I Totally Blue It" as you ribbon spread the deck all the cards have turned blue! All that is left red is the spectator's card! Wrist Kill and Brush Change Using a side steal, two variations are shown to perform a color change with different timings. Pen Up Nose A shocking visual that cracks people up and creates a different mood during your act. Cards From Mouth Another shocking visual which is taught in detail. A classic which will never be forgotten. 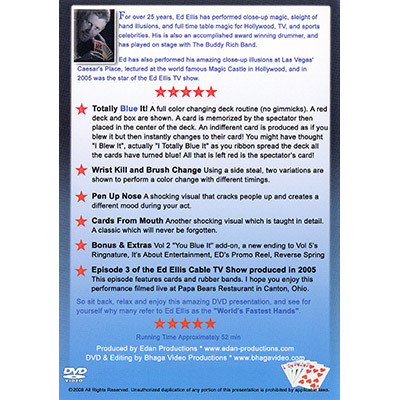 Episode 3 of the Ed Ellis Cable TV Show produced in 2005 This episode features cards and rubber bands. I hope you enjoy this performance filmed live at Papa Bears Restaurant in Canton, Ohio.